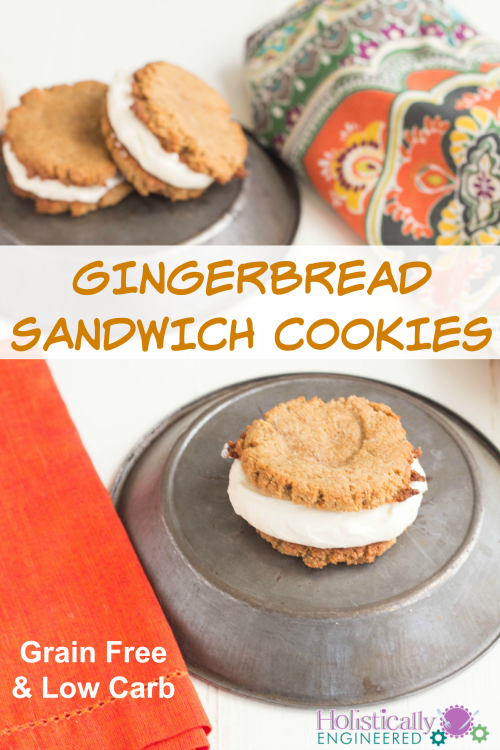 If you’re still trying to finalize your holiday dessert selection these Gingerbread Sandwich Cookies may be the perfect choice. They are simple to make..just whip up and bake the cookies, let them cool, and fill them with a cheesecake like filling. You get some of the classic flavors of the holidays in an easy to handle dessert. It’s great for parties! Mix the almond flour, coconut sugar (or Serve), sea salt, baking soda, cinnamon, and ginger. Mix the egg, molasses and butter in a separate bowl. Add the wet ingredients to the dry ingredients and mix to combine. 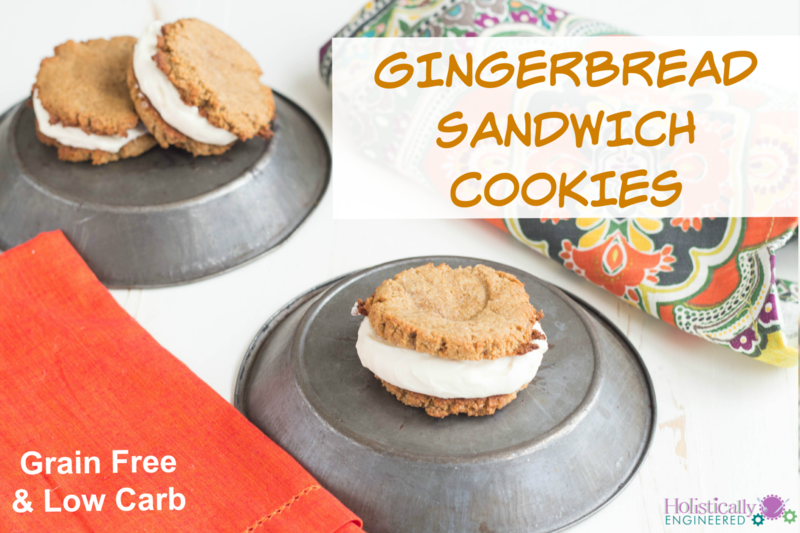 Scoop onto a parchment lined baking sheet and flattened with the palm of your hand (makes 24 cookies). Bake for 6-8 minutes or until lightly browned. Allow to cool before assembling. Beat the cream cheese with the sweetener on medium speed until smooth (about 2 minutes). After scraping sides of the bowl, add the the cream and vanilla and whip (I used a whisk attachment on my mixer) on medium speed until light and fluffy (about 2 minutes). Spread some of the filling mixture onto the bottom of a cookie and top with another cookies to make a sandwich. Repeat with the remaining cookies (makes about 12 sandwiches).